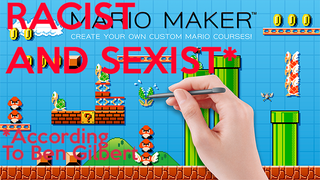 Ben Gilbert recently had the audacity to take the amazing opportunity presented to him by Nintendo to play their upcoming hit Super Mario Maker, then turn around and call it sexist. In a recent article on Business Insider, Ben Gilbert published an article centered around his disdain towards Nintendo’s decision to have a female white woman’s hand represent the movements the player makes on the Wii U gamepad and TV. He made the argument that this was excluding those who are not female white women such as himself. Apparently, Gilbert believes that because the hand on the screen is a white woman’s the game is being exclusive and denies the possibility that anyone other than a white woman would play the game. What if I were, say, a 10-year-old black girl? Or a 30-year-old Japanese man? Or literally anything other than an adult white woman (which the hand appears to belong to)? I assumed this whole spiel was just clickbait to get ad revenue, but after digging a centimeter deeper, I learned that Ben Gilbert wrote absolutely nothing about the actual game. He wrote this article, and nothing else concerning the content of the actual game (whether he enjoyed it or not), specifically because he found it offensive that the hand appearing on the TV screen was not his own. He even had the balls to call up Nintendo representatives afterwards to ask if there would be an option to change what skin color the hand would appear to be. To Gilbert’s contentment, a Nintendo official confirmed you can change the skin tone of the hand.